This is what I need to do this weekend. 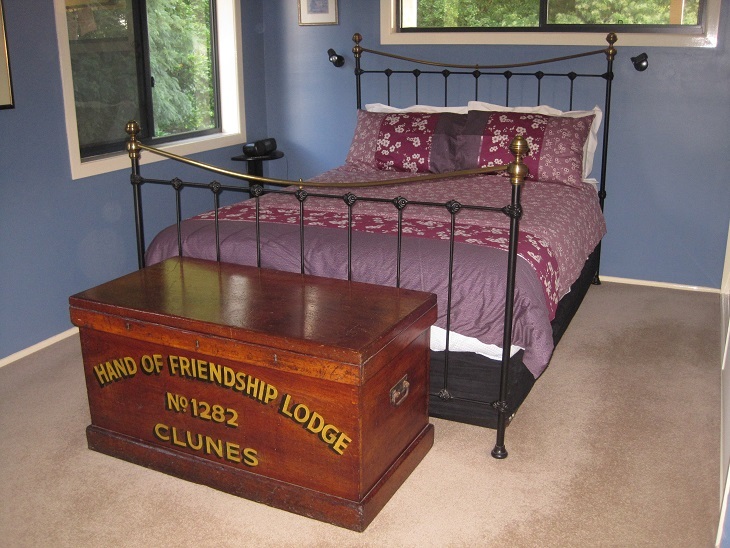 Some things never change………..
Today I had a deep clean in our bedroom. I took the mattress and base off the bed so that I could vacuum properly underneath it. I turned the mattress when I replaced it. I cleaned the windowsills, cornices and skirting boards. The valance on the base was washed. The valance was replaced and the bed remade with fresh linen. I have swapped the light coloured doona cover that we use during the summer months for this one. It changes the look of the room. Although it is the same fabric, the darker colour feels right for the cooler weather. I have not yet put the feather doona on the bed – we have a cotton blanket and lightweight polyfill doona at the moment. The weather is still quite warm at the moment but we will make gradual changes as needed. What seasonal changes do you make? First of all, here is an update on the things I am not writing about. Sewing My Stash Sunday is not happening this week because I simply have not done any sewing. War on Weeds Update – I am glad I didn’t rush out and buy a heap of vinegar because although the leaves definitely wilted and browned off somewhat the weeds are certainly not dead. I think this would be ideal for liquid weeding the edges of paths and between pavers or even for random weeds that survive the heavy mulching that we generally do when the garden areas are completed. However, it is simply not heavy-duty enough for the widespread weeds that are well-established. Back to the drawing board or more importantly the gardening gloves and get on with pulling out the weeds and getting this particular garden bed established with more shrubs and lots of mulch to naturally suppress the weeds. On to the focus of this blog post – our bedroom. I decided to seriously clean the bedroom and while it is not completely finished, I did get the wardrobe doors and the 2 large windows cleaned. The wardrobe was built almost 6 years ago and I must confess that the doors have never been cleaned. There were a few insect spots as well as some fingerprints and some small patches of mould on the off-white vinyl-finish doors. I cleaned the doors using a damp cloth and some of my home-made cream cleanser. 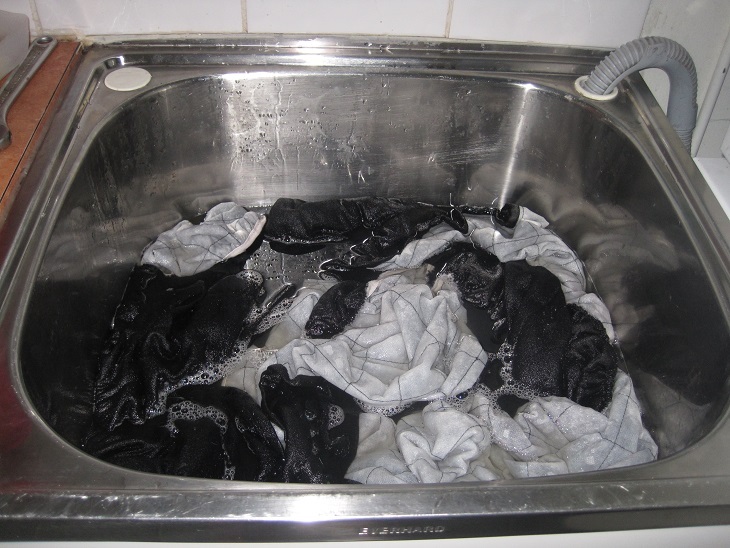 The most difficult part was rinsing it off as I could not splash water everywhere due to the carpet on the floor. I finished it off by cleaning all of the metal surrounds as well as the tracks. I do the tracks every few months as they get really grubby. 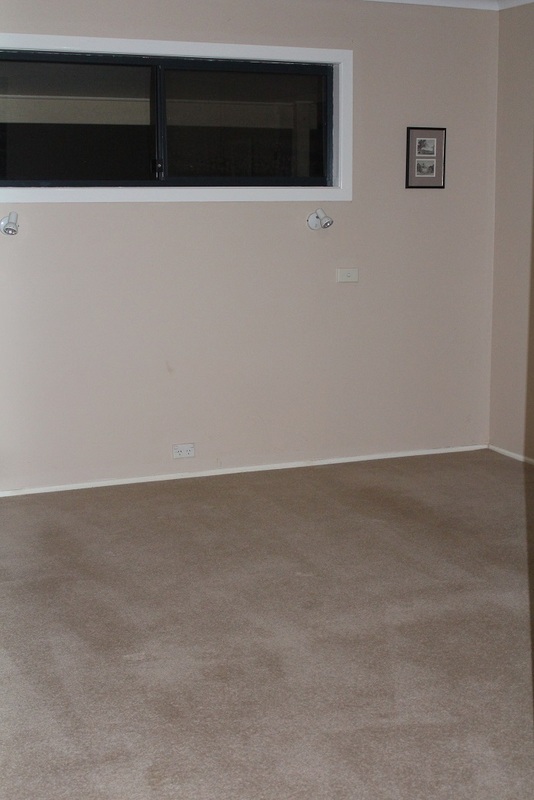 All of the shoes were removed, the carpet in the wardrobe vacuumed and shoes replaced. I have more shoes than I really need but I did not discard any as they all have a purpose and are worn, albeit, some not terribly often. The other task was an even bigger undertaking. I dislike cleaning windows at the best of times but the two on the side of our bedroom really do my head in. The accumulated dirt and cobwebs made these unsightly and since we have no curtains, that is the view I wake up to each and every morning. They are sliding windows with Crimsafe screens. This is not so much for security to stop intruders but to prevent anyone falling out through a normal flyscreen as there is no verandah on this side and it is quite highset. I can remove the sliding panel of glass and clean that but I have no way of cleaning the outside of the fixed panel nor the screen apart from washing it from the outside. Due to the height this entails assembling the scaffolding that we have and using the Gerni to blast the window and screen from the outside. I did these 2 windows as well as the screen on a small panel of louvres at the top of the stairs and the window in the sewing room which has the same outlook. These two jobs took the best part of the day but I also managed to vacuum the cornices to remove any cobwebs as well as vacuuming the carpet. 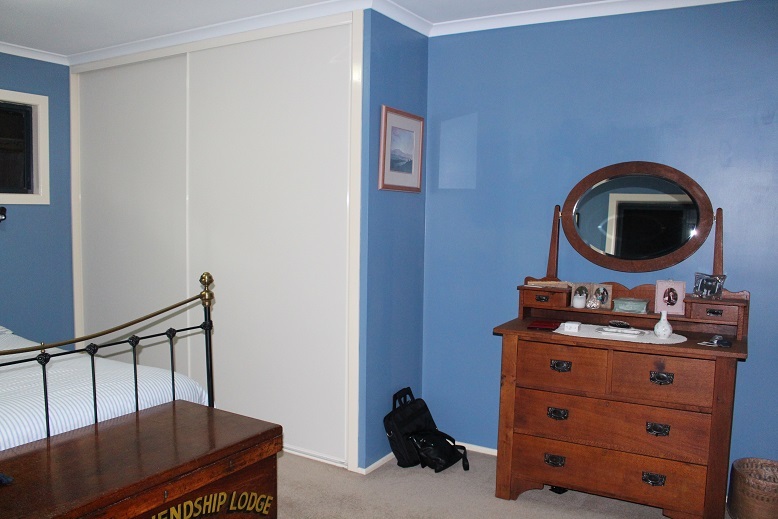 The things which didn’t get done were the window above the bed which is easy because it is over the verandah, dusting and polishing my dressing table and cleaning the light fittings. All of those will need to wait for another day. We have carpet in the three bedrooms and I generally keep it clean by vacuuming regularly and a sprinkle of bicarb soda on any grubby marks. However, I get it cleaned every 2 – 3 years and today was the day. 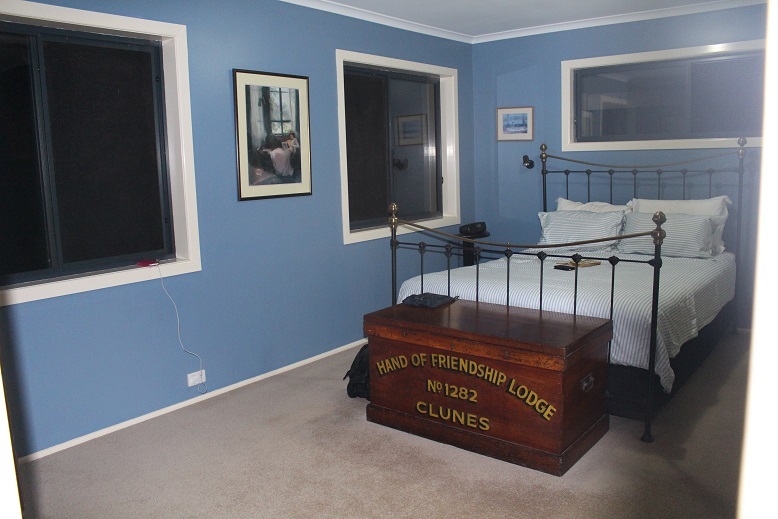 We removed everything from the 3 rooms apart from the cast-iron bed frame in the main bedroom. The other rooms are completely bare. Moving everything out of 3 rooms makes you realise how much stuff you have. Here is some of it stacked in the study. 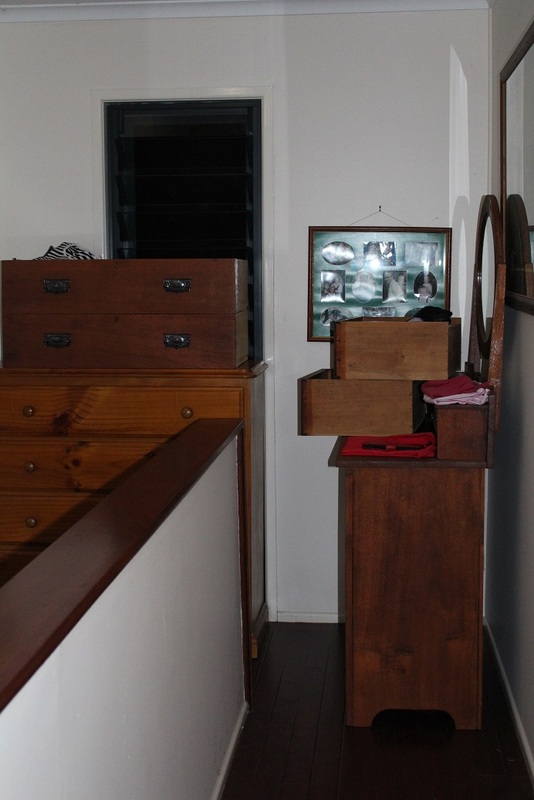 The two chests of drawers fitted in the hallway just past the bedroom. 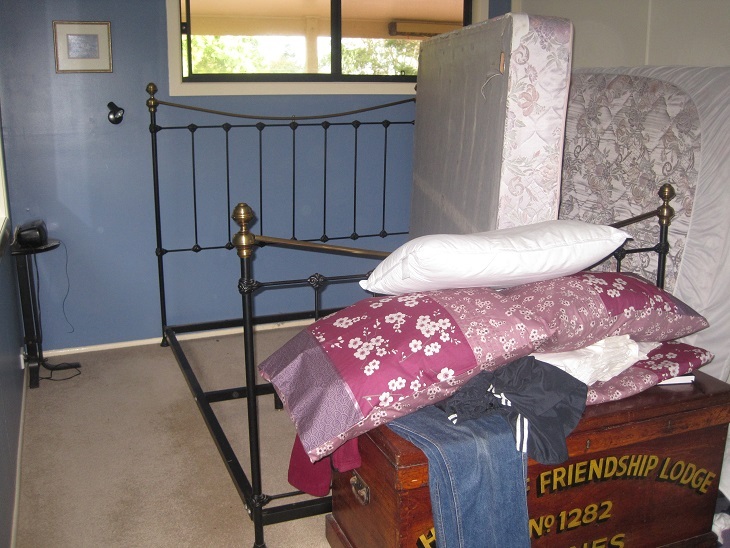 The mattress and base were in the bathroom and more stuff in the living room as well. Smaller items found temporary homes in the wardrobes. It was a sunny day and I took the opportunity to wash and air all of the bedding. 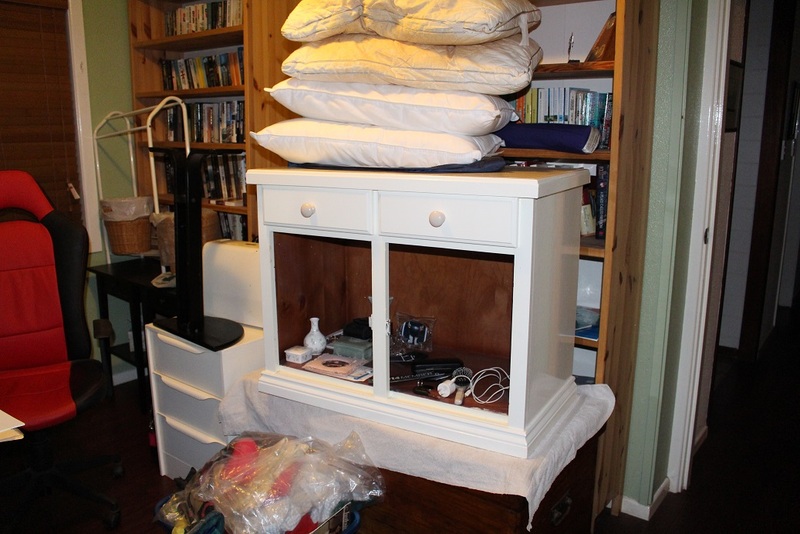 The carpet is still a bit damp underfoot so we have re-assembled and made our bed and plugged in the alarm clock but other than that the rest of the furniture and effects will not be returned to their rightful homes until tomorrow evening. I have cleaned all of the louvres in the living room (79 of them) and The Duke washed down the outside of the house and cleaned all of the outdoor furniture. Blog posts may be a bit hit and miss for the next couple of weeks as we are really busy. In between full-time work, preparations for our overseas trip in 11 days ( who’s counting? ), a milestone birthday celebration for The Duke, guests arriving on Thursday and preparing the house for the housesitters who will be here while we are away there is not a lot of time for blogging. What’s happening at your place? Here is a test to see how organised your bedroom and wardrobe are. Try getting ready for bed – remove clothes/jewellery, put away shoes, put on night attire and get into bed without turning on the light. Can you confidently move around the room and place things in their right position because there is no clutter and everything has a home? Think about how visually impaired people manage. I regularly do this and realised that it is because there is the bare minimum in our bedroom and it is always in the same place. 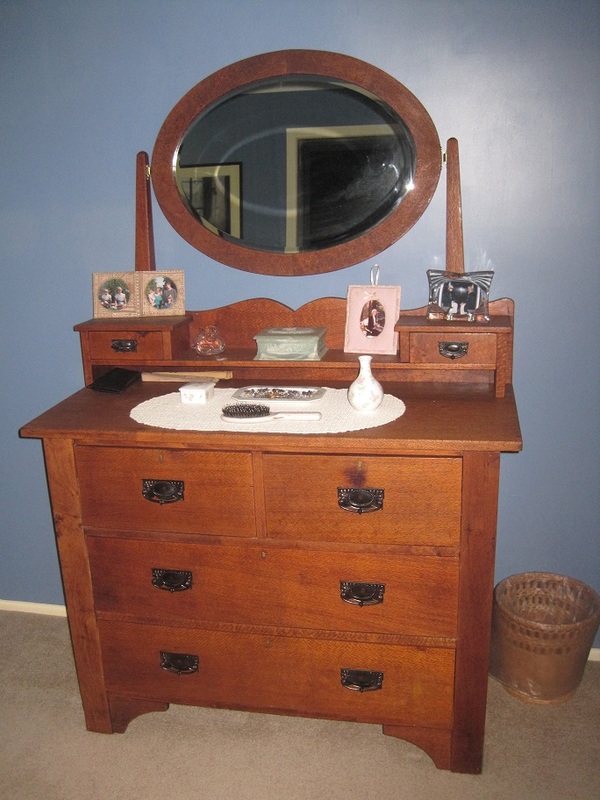 This is my dressing table and I can easily locate the box for my earrings when I remove them. For years I had heaps of clutter on my dressing table and I yearned to have it clear and tidy and once I achieved that goal I have never let it go. If you are overwhelmed by your stuff, try setting small goals and then achieve and maintain one thing before moving onto something bigger.